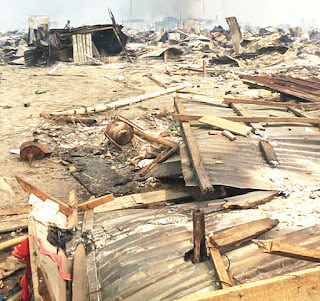 No fewer than 200 structures were burnt on Wednesday in Otodo Gbame, an Egun community in the Lekki Phase 1 area of Lagos State, during a clash between some Egun and Yoruba youths. It was learnt that the crisis started on Sunday, when the Yoruba youths demanded that the residents should relocate from the area. It was gathered that the Egun community insisted that residents would not leave their houses, tagging the youths as hoodlums and land grabbers. It was further gathered that the crisis came to a head on Wednesday when the Yoruba youths set fire to the structures in the area at about 8am. The action was said to have triggered a clash between the youths of the Egun community and their Yoruba counterparts. Two persons were said to have been injured during the clash, while the area was quickly deserted as the fire raged. Some residents reportedly salvaged their property from the fire and fled. It was learnt that policemen from the Rapid Response Squad, the Maroko division and the Area J Command, Ajah, went to the area to restore normalcy. A policeman on the team said an abandoned two-day-old baby was rescued from one of the burning structures. A resident, who identified himself only as Hunsu, said, “The crisis started on Sunday. Some people came and said they had bought our land and we should relocate. We did not know that the hoodlums would go to this extent. The state Commissioner of Police, Fatai Owoseni, went to the area around 2pm and held a peace meeting between the leaders of the two groups. 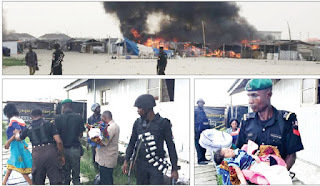 The Lagos State Police Public Relations Officer, SP Dolapo Badmos, said five suspects were arrested in connection with the crisis. She said, “The command received a report that the Egun and Yoruba communities were engaged in a serious brawl over land issue. Upon receipt of the information, the command operatives from the RRS and men of the Area J Command moved in. Some shanties being occupied by the residents were set ablaze by the warring factions.